The centre of political life in the UK, housed in the Thames-side Palace of Westminster. Tours of the Houses of Parliament offer a unique combination of one thousand years of history, modern day politics and stunning art and architecture. 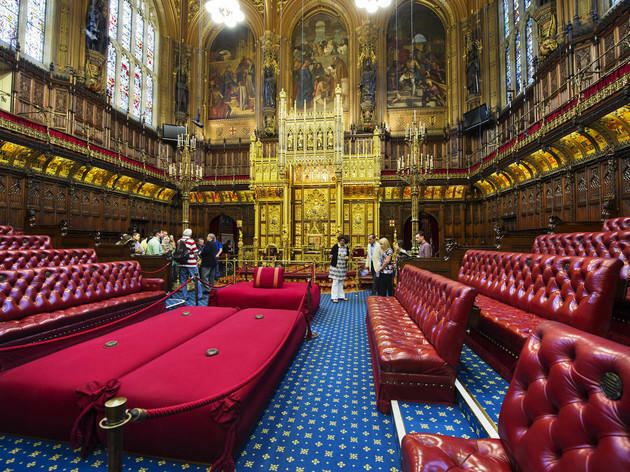 A highly recommended audio tour brings this to life through the House of Lords and House of Commons and takes around 60 to 75 minutes, featuring leading Parliamentary figures such as Mr Speaker and Black Rod. Most of what is seen on the tour was built in the mid-19th century following a devastating fire in 1834, but the route also incorporates the magnificent Westminster Hall dating from 1097. Other highlights include the Queen’s Robing Room, Royal Gallery, Lords Chamber, Central Lobby and the Commons Chamber, scene of many lively debates. A family version of the audio tour, aimed at children aged 7 to 12, is in the style of a ‘live’ news broadcast with time travelling reporters ‘reporting from the scene’ on the many historical events associated with Parliament. For those not able to visit the Houses of Parliament in person, a new 360-degree virtual tour is now available on the website, allowing jazzy panoramic views into some of the most famous rooms, with clickable facts and historical stories as you virtually snoop around. These new virtual tours, the ticketed guide-led tours and solo-audio tours are all in addition to the free tours that continue to be available to UK residents via local MPs or members of the House of Lords. Pre-booked audio tours: £18.50, £16.50 concs, £7.50 child (5-15), free under 5’s. OTD audio tours: £20.50, £18 concs, £8.50 child (5 -15), free under 5’s. Pre-booked guided tours £25.50, £21 concs, £11 child (5-15), free under 5’s. OTD guided tours: £28, £23 concs, £12 child (5-15), free under 5’s. Saturdays throughout the year and most weekdays during holiday periods including Christmas, Easter and the summer. See venue website for full details. In the height of the heatwave this was the coolest place in London, literally! The stone walls kept the heat out but I don't think that was the only reason I had chills! What these walls have seen is just amazing - Guy Fawkes sneaking below, The decisions made, laws passed and Henry the 8th lived here and all the monarchs line the walls in oil watching you. The tour was magnificent with so many insider stories, historic facts and explanations of proceedings and hilarious traditions that still happen today. I would recommend this to absolutely anyone - whether you think you'll be interested or not I guarantee you'll be blown away by this fascinating journey back in time that gives you true insight into the way things happen today. As a born and raised Londoner I don't know how I made it to the age of 38 without ever stepping inside the Houses of Parliament - but so pleased I finally did! This building is every bit as stunning on the inside as it is on the outside, and our Tour Guide was brilliant in giving us the overarching history but also interesting little nuggets of information. Such as Guy Fawkes was tried in the Great Hall when it was still used as a courts of justice. Winston Churchill was laid out overnight in his coffin here before his funeral. The Queen never sits in the red velvet throne chair in the room she uses to prepare for the Opening of Parliament, she prefers to sit on the sofa - however Queen Victoria did used to sit in that chair and the weathered look on the seat isn't from use, it's from sun damage, which is why thin gauze blinds now cover all the windows. For major votes the House of Commons divides into the voting lobbies, which are two corridors that run either side of the chamber, and members are counted as they enter into each. They have just 15 minutes to assemble once the vote is called, and on one infamous occasion an MP thought he had got in just in time by ramming his foot into the door, but he was bluntly told 'you vote with your head, not your foot" and refused entry, thus missing the vote. Just quirky, interesting little facts like that were a pleasure to hear and made the tour all the more memorable. I would thoroughly recommend going with friends, family or alone - you won't regret discovering more about this fascinating building, steeped in royal and political British history. The Houses of Parliament are probably my favourite building in the world - I love not only the architecture, but also what it stands for. This is the second time I have been able to visit and it doesn't get boring - there are so many stories to be told and you get a different take each tour. Both the guides I have had have been very different, but both were excellent. A definite must and you can write to your MP to have a free tour - it can take some time though depending on your constituency. Also, write to your MP for free tickets to PMQs and a tour of Big Ben - when it reopens in 2020. I’ve never been on a tour of Parliament so I was really excited! The tour I went on was a LGBT Pride tour. It was a small group and I’m sure one couple had no clue what they’d signed up for! I love history so I loved hearing the rumours of homosexuality in the court and later in the Houses of Parliament. I do wish we’d have heard some history that related to what we were seeing though. Was a fascinating tour and I enjoyed every second. House of Parliament should be a must on every Londoners list and is definitely worth a visit. What a fascinating tour, I would recommend our guide Daniella who was so informative! The exterior is clearly one of the most significant and iconic buildings within London. However let me tell you the interior is equally if not more impressive. You'll be amazed by the ornate detailing, giant frescos, mosaics, wooden panelling, to the thrones covered in 24 carat gold leaf where the Queen delivers her speech during State Opening, I could go on and there was so much to take in... I learnt so much about past kings and queens, significant battles and events that shaped British history involving notable politicians and figures. 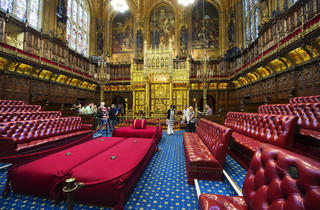 Plus you get to step inside the actual Houses of Commons and Lords!! Their tours run throughout the summer and there are themed tours too. There is also currently a great free voice and vote exhibition to check out in the Westminster Hall. Look out for the ‘New Dawn’ contemporary evolving light installation celebrating the women’s suffrage just above the entrance of St Stephen's Hall. Many people don't realise how easy it is to visit the Palace of Westminster, so don't be one of them! It is dead easy, and it is something every one should do at least once. Housing both the House of Commons and House of Lords, the history of both and related elements of British democracy are covered during the tour, along with fascinating anecdotes. The tour starts by following the journey of the queen when she robes up for her ceremonial opening of parliament, then works its way back through the two houses and chambers starting at the back with the Lords. As the palace is huge (with over 1000 rooms) and a history spanning over 1000 years, you can only really get a flavour of the place, but that is more than enough to tempt you to want to learn more. Having been before with friends who worked there I would highly recommend this tour as you simply get to linger longer in the areas of interest and hear all the relevant information to that location, though admittedly you do only see the main sights on the tour. At current you can also get access to the Voice and Vote exhibition in Westminster Hall about women in parliament, the suffragettes and the right to vote which is also very interesting and well worth a look. I had never thought of visiting parliament before, in fact I wasn't aware that it was open to the public so when I was invited to take a tour I was quite intrigued. I'm not really much of a fan of politics and was a bit worried that I would find it boring if I didn't know what they were talking about but there was actually so much more to it than just politics. For a start the actual building is amazing, from floor to ceiling it is full of intricate details, ornate decoration and historical paintings. I never normally opt to join in with tours as I like to just explore by myself but our tour guide Daniella was full of information, facts and amusing anecdotes. The Royal family play a big role in Parliament and since watching The Crown and Victoria on Netflix I have become much more interested in the history so found it all really interesting. I would definitely recommend a visit to anyone interested in architecture, art, history or politics and you can finish off the tour with a trip to Voice and Vote: Women's place in Parliament exhibition which features unseen historic objects, pictures and archives from the parliamentary collections, this will be on until 6th October. To see where laws and decisions are made was an absolute treat. I was struck by how surprisingly quiet it is when you enter the grounds of Parliament, particularly when the Palace of Westminster, as it is also known, is surrounded by busy roads and visitors. When you first enter the Palace, you walk into one of the oldest parts of the building, Westminster Hall. It is a great cavernous hall that boasts a hammer beam roof which is the largest medieval timber roof in the whole of northern Europe. It stretches the length and breadth of the hall, and leads the eye to a beautiful stain glass window at the far end, which is a memorial to members and staff of both Houses of Parliament, as well as police officers, who died in the Second World War. This is a touching tribute as the previous window was broken in a bombing raid. Today, the hall is used for ceremonial occasions, particularly when members from both Houses come together. Whilst in previous years, famous names like Guy Fawkes and Charles I, were tried here and then condemned to their fates, more recently, famous names such as Barrack Obama, Nelson Mandela and the Queen have all spoken here. From here, as I was on a guided tour, we walked the length of the Palace to the far end, through St Stephen’s Hall, Central Lobby, to the Robing Room. This is where the Queen puts on her ceremonial robes for State Opening of Parliament. There is a well worn throne in the room, that was used and made for Queen Victoria during her reign, otherwise the room is quite empty. Interestingly there are five frescos depicting chivalric virtues hospitality, generosity, mercy, religion and courtesy. Two other frescos were never completed, representing fidelity and courage due to the painter, William Dyce dying. Portraits of Queen Victoria and Prince Albert have quite appropriately been put in their place. Leading from here you enter the Royal Gallery, where two massive frescos, opposite each other dominate the space, depicting the death of Horatio Nelson and the meeting of Duke of Wellington and Field Marshall Blücher prior to the final defeat of Napoleon. From here it leads into the Princes Gallery or anti-chamber to the Lords, which has portraits of King Henry VIII and his wives before finally going into the first chamber of the tour, The House of Lords. The chamber is spacious and is surrounded by a viewing platform for members of the public to come and watch proceedings any day the Lords are in session. At one end, on a dais is the Royal Throne, where the Queen sits to read her speech. In front of this is a woolsack where the Lord Speaker sits. The sack contains wool to represent the economic importance of the wool trade in (circa) 14th Century when the sack was first introduced. It was found that over the years wool was replacement with hair, however in 1938 it was restuffed with wool from England, Scotland, Wales and Northern Ireland, as well as other Commonwealth countries. Interestingly you are only allowed to sit in the seats if you are a Lord or a Barron, and the colour used is primarily red, whilst the Commons is green. Following the Lords is the octagonal Central Lobby which is the heart of Parliament. Here MP’s meet constituents, or other members to meet from both Houses. Make time to really appreciate all of the intricacies of this lobby, and make sure to appreciate the four mosaic panels situated over each of the exits, they depict the patron saints form each constituent country, in really marvellous detail. It is impressive that for a Palace where speech and written law are so important, visual imagery has an overwhelming influence in practically every room you enter. Apart from the Chambers themselves, the members lobby and the Churchill arch are likely to be the next most well known areas of the Palace, because of the statues of Prime Ministers considered to have had a changeable effect on the country during their term. They are Winston Churchill, David Lloyd George, Clement Attlee and of course Margaret Thatcher, the only prime minister to unveil her statue whilst she was alive. Entering the House of Commons, it is striking just how small it is. Unlike many other Parliaments where there is a lot of space, this chamber doesn’t actually have enough seats to sit every MP, which is why many reserve their seats in advance. Like the Lords, there is a public gallery and dispatch box, but one touching tribute which wouldn’t be seen enough are 42 heraldic shields commemorating each of the MP’s who died during both World War’s. More recently, there is a shield sitting alone, commemorating the MP Jo Cox who was tragically killed. Walking back out down St Stephen’s Hall you are offered a final opportunity to reflect on all that has been seen. This Palace is a sheer wealth of history and commemoration, from Queen Victoria’s throne in the robing room, to Jo Cox’s shield, whether old or new it all has its place, and most importantly, it’s individual right to be there. There is a exhibition on ‘Voice and Vote, Women’s place in Parliament', which is well worth a look. Guided tours are £25.50 if you book in advance and £11 for children aged 5-15. There are also audio tours and family tours for younger children. After living in London for a few years, this for some reason wasn't high on my 'to do' list. After doing the tour, I thoroughly recommend paying a visit - whether a tourist or a local. It's such an iconic building, with amazing history. The interior inside is simply stunning, and far surpassed how beautiful I expected it to be. We had a guided tour with Daniella. She made the tour very enjoyable, had great knowledge, and engaged with the attendees well. The Houses of Parliament has 1000 rooms! You don't get to explore them all, but definite highlight has to be being in the House of Commons. The detail by Augustus Pugin throughout is magnificent. Unfortunately you aren't allowed to take many photos, but you can in the main hall, and St Stephens Hall. This is definitely a tour worth doing. As someone who grew up in Essex, regularly popping into (and now living in) London I thought I knew everything interesting about British history. Alas, like most locals, exploring your own history isn't something we often do. Whether you're British, grew up in London, or are a tourist/ traveller/holidaymaker this is a great tour. Not only do you get to step inside some of the most coveted buildings (including royal chambers) but you'll get to learn a wealth of history that's still alive and kicking today. The best aspect of this tour is definitely the amount of art that's cherished inside the walls, which simply adds to the tour as there's a strict no-photos policy - so only those who've been will know the beauty. I have to say I think this is one of the BEST TOURS IN LONDON! Particularly if you are international and/or have an interest in English history. Not only do you get to see the INSANELY beautiful interior of Westmister but you get a brilliant crash course in English history which I loved!!!! Our guide was Daniella and she was engaging and entertaining. We walked in the Monarchs shoes for the route they take each year when opening Parliament. The art and architecture inside the building is simply awe-inspiring (the photographer in me was so sad no pics inside though). The actual political stuff was kind of a side note, surprisingly, but was still really interesting to learn how the parliament votes and the rules about royalty in the House of Commons. Finding out that anyone can turn up to Westminster and ask to speak to their representative was really interesting and I think a little know right! If you only do one touristy/cultural thing in London Town I would highly recommend this!!! Well, wasn't I wrong and so very pleasantly surprised. There is far more to The Palace of Westminster than I had been led to believe; when shooting a meeting for a charity, you don't get situated in the royal gallery, or the robing room. Odd that. And being up close - standing by the very seats that MPs, Lords and Peers occupy - is quite a thrill. Especially when you see the debating table right in front of you and realise that history has been made right there, over and over again. The lavishness of the rooms and corridors of the more formal areas is more than impressive and far far different to the more functional meeting and event rooms in the rest of the building which are, not surprisingly, not featured in the tour. With a fantastic guide pointing out details all along the way, you really get a sense of what goes on here and how everything works. Standing in the Commons being told about three-line whip, white and green papers and the role of the Lords brought me right back to my Politics A-levels, so if you are a student in this subject the tour will definitely be a really bonus to your learning. For those of you who love history and what to know more about British government, you'll be well informed by the knowledgeable guides. And for those, that simply love a beautiful building and want to enjoy great architecture and fun facts about the British government past and present, this will suit you just fine. The guides are full of facts and knowledge, but they keep it light and relatable too. A wonderful experience to explore behind the scenes of, arguably, the most important building in this country and see how the system of UK democracy works; even if, when we follow the news, it appears to be entirely broken! Please note that the tours run all summer long, even though Parliament isn't working, the tour guides certainly are. You can also save a few quid and take a self-guided tour, you'll still get loads of information about each room, you'll just go at your own pace. Personally, I'd recommended the guided tour though if you can. I thoroughly enjoyed the tour of the UK Parliament. It affirms my belief that as long as you know about William the Conquerer, Henry the 8th and all of his wives, Queen Victoria and Elizabeth, you can relate to most iconic sites in Britain =P I was not expecting the parliament to be as lavish and ornate - what a beautiful palace that our elected officials get to work in. The house of commons and house of lords are open to visitors to listen in when they debate bills, I definitely want to do this for Brexit topics! And be prepared to stand most of the tour, as the chairs you will come across will be ones reserved for queens, lords and MPs. Our guide also told us a lot of fun anecdotes as we travelled through the rooms (which also travels through time), my favorite is when Margaret Thatcher unveiled her own ore statue and said "it would have been better if it's made of iron." Daniella, our fantastic tour guide made the 90 minutes tour flew by. There was a lot of listening and walking but the history was fascinating and the rooms were majestic, particularly the Queen's Robing Room and the Royal Gallery displaying gold plated statues and thrones and old portraits of the Royals. The House of Lords and the House of Commons were nice but felt rather small especially if you are thinking about accommodating all (hundreds of) Lords or MPs in each of the house. Inside and outside, the design and architecture make this House of Parliament one of the most beautiful parliament buildings in the world. I would recommend the guided tour to those interested in the British history, be it visitors or UK residents. The admission price is good value given that one could learn so much about the British history in an interactive and entertaining way. What a fun and interesting tour! Highly recommended doing one of the guided tours here, our tour guide was brilliant and took us on the route the Queen would do! Was amazing, such beautiful architecture and history! The highlight for me was physically standing in the house of commons and of course seeing the Queen's robing room! Very lavish! Great place to visit this summer, and check out the voice and vote exhibition whilst you're there; all about womens place in parliament! Ok wow! Always considered the Houses Of Parliament to be one of my most favourite attractions of the city with all its history. There is no excuse for not having gone inside sooner and I urge all (locals and visitors) to make sure to go for a guided tour. Our tour guide was a delight, incredibly knowledgeable about not only the politics and history, but also the architecture of this magnificent building and the whole experience was absolutely worth every penny. Tours can be either audio tours or guided tours and the prices vary depending on which tours are booked. If you haven't been yet, by all means GO GO GO!!! For anyone for has any interest in british history this is a tour like no other. Tells a story of our country from medieval times to modern day, while also sharing how accessible our government is. Our tour guide was overflowing with information and kept a strong pass going from room to room. Something I wasn't expecting is the true beauty of this building and combined with history just created true magic. I really couldn't recommend visiting the Houses of Parliament more. Our enthusiastic and knowledgable guide gave us a fascinating tour, leading us through both Houses and showing us the various voting chambers and lobbying halls. She provided so much insight into the history and inner workings of Parliament and I won't soon forget standing in the middle of the iconic House of Commons. A real treat for the summer and an experience not to be missed. For some reason, my friends and I looked at the Houses of Parliament as certainly a beautiful building but somehow closed to the public. Which is a bit silly considering you can often witness tourists queueing in front in summer months. I’m sure glad we looked into going in because this was an incredible visit! The interiors are incredible with gorgeous gilding, flawless statues and unbelievable architecture. Just for that, it is absolutely worth the £25. On top of that, you also get mountains of info about the ins and outs of British politics and the working of government. Eye-opening! It is very worthwhile booking yourself on to a free tour of the Houses of Parliament. The tour is only about 70 minutes but the amount of information in that time is astounding and demonstrates the impressive knowledge of the guides. Unsurprisingly photos are not permitted for the majority of the tour but you will have access to both the house of Commons and the house of Lords as well as other areas. At the end of the tour you are permitted to take pictures and can stand in the same spot as Nelson Mandela when he gave a speech to an attentive crowd. It's such an amazing place and we'll worth the visit. A beautiful interior and incredibly informative tour makes this a must do for any local or tourist in London! To be honest, it's never really crossed my mind that you can even enter the Houses of Parliament; in my mind, though I have admired the exterior a number of times over my years in London, I saw it as a very much 'them' and 'us' setup and as such, the place to be exclusive for politicians and their visitors. So when a fellow Tastemaker told me that this week, on the run up to the election, they were offering free tours, I was all over it. We were lucky to only have about 10 of us in our tour group and were led around by a wonderfully funny lady who kept things engaging throughout. We met and started in the incredibly enormous Westminster Hall, the oldest section of the palace having stood there for 900 years to date. The hall has a beautiful wooden roof and a series of floor plaques commemorating those lucky enough to have lay in state there over the years including Sir Winston Churchill. It is also the place that both Obama and Mandela have both been invited to make speeches, a very rare honour indeed. We then proceeded up through St Stephen's Hall that stands on the site of the royal Chapel of St Stephen's and was where the House of Commons sat until the Chapel was destroyed by the fire of 1834. It is in here that King Charles I stormed the Commons demanding that the 5 MP's that opposed his God-like claims stepped forwards for execution. Little did he know that it would be this action that would mark his demise as King and his own execution! Then we visited the Royal Gallery where the Queen walks between the Robing Room and House of Lords to read out all new laws, the beautifully ornate and golden House of Lords itself and then finally the House of Commons and all of the halls and lobbies in between. Having only ever seen these rooms on television I felt overwhelmingly proud and honoured to walk the halls and learn more about our political and royal history! 1) It was once the Royal Palace and was last lived in by King Henry VIII himself until he got bored of having political meetings in his home and moved to Whitehall, leaving the Palace in the hands of the MPs and Lords. 2) William Pitt was the youngest serving PM at 24! I could go on and on and on. Needless to say I loved every second of my visit and encourage everyone, whether you have a vested interest in politics or not, to try and get on one of these tours that I believe usually cost £25 and run at the weekends only. Worth every single penny. After a superb free tour of Elizabeth Tower and Big Ben, booked through our local MP (would recommend, see review under "Big Ben" listing) we were invited by out tour guide to visit the Houses of Parliament and attend one of the live debates happening. I had no idea that anyone is welcome to come in and see the inner workings Governmental decisions, otherwise I'm sure I would have visited sooner! I'm never one to turn down a bit of London culture, especially when it's available free of charge so of course we of course took the advice and went inside. As you enter the interior was grand and the design was intricate and striking, it's the type of place that absorbs you completely as you find yourself doing a 360˚ to take it all in. As easy as it would be to get snap-happy, photography is only permitted in certain areas, to do look out for and abide by the signage. We found our way up to the public galleries and watched on whilst current issues were being debated, this was fascinating to me - the tempo and conflict meant it made for captivating viewing. This was a great way to end our visit, and ticked off another must do in London, I am now inclined to book a Parliament tour through our MP to get the full experience. If you a little lost on how UK's politics operates, this visit is for you. Besides being able to see the oldest part of the building that survived fires and wars to protect the remains of outrageously famous royalty (goose bumps just remembering) at the Westminster Hall, you can walk through history itself with FREE audioguides to explain the plots and twists of modern Britain. A glimpse of the very golden House of Lords with HRM throne, as well as the more democratic House of Commons should clear the skies on how power is divided but almost never shared in this never ending dispute for power. Of course, you could also wait for them to be in session and try to sneak in for free, but I found the paid visit to be quite enlightening, as well as allowing for broader exploration of the building. I heard that you can book a tour of the Houses of Parliament by requesting this from your local MP (there is info about how to do this on the website for the Houses of Parliament) and it turns out that this is all true. You request a tour and your MP books you in and it's completely free. Amazing! The tour was genuinely interesting and you get a really good look at all of the critical sites within the famous building including the Queens dressing room, the House of Commons and the House of Lords. This is worth doing purely to see how beautiful the internal architecture of this building is. Literally breathe taking! The tour guide we had was great too, light hearted yet very informative and you could tell he really loved his job. The only down side to this attraction is that the tours only take place on weekdays so if you're a standard Monday to Friday 9 to 5er you'll need to get some time off work. I was booked on a 0940 tour and was done by about 1100 so a half day off work should cover things and trust me it's definitely worth taking the time off to do this. So interesting to see it up close and not just on TV. The House of Commons and the House of Lords both seem smaller than they look on TV but it's amazing to wonder around in those very rooms. The Houses of Parliament: we’ve all seen it from the outside and Instagrammed it, but did you know that you can actually go inside? Yes, really. You can’t just walk-in, however, You must book yourself onto one of the tours run daily and believe me, it’s brilliant. With your incredibly knowledgeable tour guide, you’re taken through the many rooms in this maze of a building including The Queen’s Robing Room, Central Gallery, the House of Commons, the House of Lords (obvs) and so much more. Your guide will tell you all you need to know about the buildings history, tradition, and quirkiness. You’ll find out answers to questions like where did the world ‘parliament’ come from? Why a monarch cannot enter the House of Commons? Why the building is sometimes referred to as the Palace of Westminster and the Houses of Parliament? Why someone always checks the cellars of parliament at every state opening? Why the symbol for parliament is a portcullis. It’s absolutely fascinating. Over one thousand years of history, stunning art and architecture all to be explored in this grandest of buildings. Every corner you turn, from the paintings of royal monarchs whom parliament has acted under, to paintings depicting pivotal moments in English parliamentary history, you can actually feel history and tradition everywhere you turn. Sadly, no photography allowed but you can unapologetically snap the hell out of Westminster Hall and St. Stephen’s Hall, both mightily impressive and guaranteed to give you loads of ‘likes’. The only downside? The guided tour is pricey. However, I feel it offers a lot more value than the other attractions say, The London Eye. If you have a must-do list when in London, then a trip to Parliament must be there. It's one of the best tours in London. Top tip: if you’re UK citizen, you can book yourself on these tours completely free if you contact your local MP. Your welcome. I only went to Westminster Hall on Open House weekend but it was fantastic! I didn't realise you can take guided tours and I will be booking as soon as possible. It was easy to get into and so amazing to be close to such a historic and iconic building. Even if you decide not to take a tour, just looking at the architecture is so special! Update 2018 - Ok so I made it back to Parliament for a Guided Tour and it is highly, highly recommended! you have a group of around 15 people and it is a well oiled machine! I wasn't allowed to take snaps inside but the Robing Room which the Queen uses is phenomenal and I don't think I will ever forget the magnificent golden throne in the Lords. The guides are knowledgable and professional so it is well worth the visit. I also recommend the Afternoon Tea which is served up next to The Thames which is a total treat. Apparently Parliament is due to close for a 6 year refurbishment in 2025 so visit now before it is too late! I feel like the tour of the Houses of Parliament is very underrated, people seem to think it's not interesting but I'm here to recommend it with all my passion! The first time I've been there I was fourteen, during a school trip, and I wasn't that enthusiastic with the idea of going. I was so wrong! I enjoyed my visit so much, our guide was super nice and the history - as well as the present - of the Houses of Parliament was so interesting to listen to. It's one of the best memories I have of my first time in London. I have been a second time a couple of weeks ago with a friend who really wanted to go, and once again it was such a great tour. You are given a free audio guide and I promise you won't be bored at all. The building is beautiful and the history is amazing! Also, if you get a chance, it's worth going early for a VERY cheap full English breakfast and this spectacular view! One of the best tours you can have...Even if the tickets seem a bit expensive, it definitely worth it. You are given an audio guide (free of charge) that provides you all the useful information about the history of this impressive building. You will have the chance to wander around the parliament's halls (House of Lords and House of Commons) and see the place where all decisions for country's future are taken! Recommended! I've done this tour 3 times and each time is different and enlightening. Very interesting and well organised tour of our seat of government. Last time I went they were trialling the audio and though I was a bit apprehensive, it was actually very good. If the news that the building is crumbling and Parliament may need to be moved to a new building, I suggest everyone books a tour of this historic building before it's too late! I really enjoyed the tour. It was great fun to see the House of Lords and house of common. It was just wonderful to have a look on the inside of the Westminster.